We are frequently told by new clients as we first visit their house, that the listed protection “only relates the façade” or “what is in the list description”, but unfortunately for those with libertarian instincts, this is far from the case. The protection conferred by the listing is likely to apply as much to the mineral tiled 1960’s suspended ceiling or the avocado bathroom suite, as it does to the Georgian door casing or the linen-fold panelling. The list description is a merely a physical description of the property, given the information that the field officer had available at the time of listing. The purpose of the list description is mainly to aid identification of the building and the fact that a feature is or is not mentioned is not an indicator of its historic importance. Buildings in England were conferred listed or protected status as a result of the town and country planning legislation which has placed a duty on the Secretary of State to compile a list of buildings of architectural or historic interest. Periodically this process has been given a boost with the advent of new legislation, resulting in turn in local authorities officers scouring their area for properties suitable for addition to the list. The result is about 500,000 listed buildings in England. At times when the pressure has been on to increase the number of listings, then the decision to list may have been the result of a quite limited inspection depending on the officer resources available. This can be reflected in the list description, by it being very brief or in the occurrence of errors or anomalies. The list description has a doubtful status, it is intended to aid identification but in some cases it actually raises doubts, and very occasionally it is just plain wrong. Whatever the case it does not affect the protected status of the building which remains protected in its entirety. If you take away the list description from the listed building then you are left with just the main fact of it’s listing, so most of us, despite knowledge of the flimsy nature of the information it is based on, turn straight away to the written description as evidence of what the building is. This is a result of human nature and the up-shot is that it is possible tor the building to become the list description rather than the other way around. We have found ourselves dealing with what was described in the listing as an “18th century artisans cottage” although map evidence and tithe awards showed quite clearly that it had still not come into existence in the 1840’s. Despite our evidence this little house remained in everyone’s minds, and for listing purposes, 18th century in it’s origins. 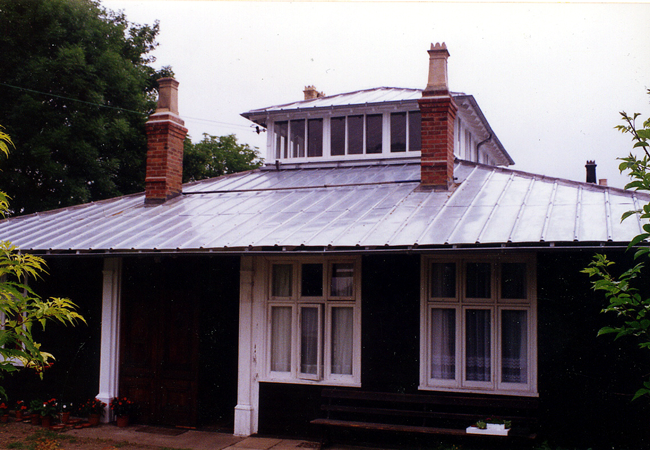 On another occasion we were working on a very nice arts and crafts house attributed to Arthur Heygate Macmurdo and described in the list as having a “hipped corrugated zinc roof”. This roof has a very attractive and unusual rolled profile. Investigation of the roof, which leaked badly, showed the sheets were iron not zinc, with a significant build up of paint applied each summer by a previous owner in a thrifty effort to postpone the day when replacement was unavoidable. Despite exhaustive research we failed to source replacement iron, instead we happened on an ancient set of rollers for zinc sheet to an identical profile to the sheets on the roof. We decided to use zinc as an alternative . This required a listed building application for consent to, in effect, making the building match it’s list description. When consent came through and the work was complete the list description was definitely fact not fiction and definitely very useful in its primary role of identifying the property. Ben Downie is an architect who is accredited in building conservation, a partner at Inkpen Downie Architecture and Design. Inkpen Downie are a practice of Architects and Designers who specialise in alteration and repair works to historic buildings, as well as energy efficient new structures. For further information please contact us here.